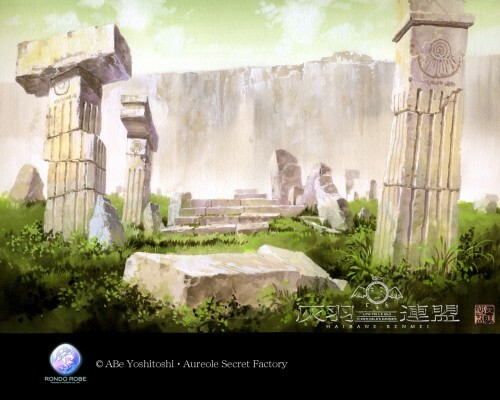 A beautiful daylit scene of the ruins in Haibane Renmei. very nice, could you tell me where you got the pics? I like a lot the way the picture was done - it looks like a painting. Maybe it's due to the paper it was done on, nevertheless it's awesome. I really like the grass in this picture, as well as the stone ruins, they are full of detail, especially the background. Great scan! Ah, The ruin of flight , So beautiful. .oO What about the night scene of this view? Now thats cool, I'm glad I can find background images on here! thanks for sharing! wow! beautiful! thanks for sharing!